The Oppo N3 details keep trickling and the latest piece of news comes from the company's CEO himself. In a Weibo post, Tony Chen says the 16MP sensor of the N3 will have the ample 1/2.3" size, which will result in higher quality images. He also shared a comparison image, which you can see above. 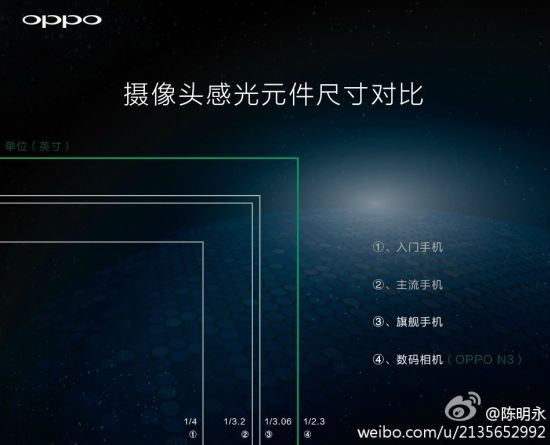 The Oppo N3's sensor size is compared to the likes of the Galaxy S5 and Galaxy Note 4, which sport 1/2.6" sensors, 28% smaller than the N3's. The HTC One (M8), Apple iPhone 6 both have a 1/3" sensor size, while the original Oppo N1's sensor is 1/3.06". In another leaked detail yesterday, Oppo revealed what the N3 rotary camera looks like. The rest of the Oppo N3 specifications should include a 5.9" 1080p display and the latest Snapdragon 805 chipset with 3GB of RAM. Just like with the original Oppo N1, the camera will be capable of 206-degree rotation and will feature a dual-LED flash. The phone is going to be available in white, pink and cyan and will feature either stainless steel or aluminum-lithium alloy body. Any day i will pick "LENOVO VIBE Z2 PRO" over this Oppo.. 16MPX 16:9 sony sensor (F 2.0 aperture) Over 500ppi display in a damn slim body. Cos you there's nothing special about the Kzoom? Any idiot can stick a camera to a phone and call it a day.